A former Royal Air Force pilot and trained Human Factors facilitator, our keynote speaker Mandy Hickson has a remarkable insight into decision making under pressure, calculated risk taking, and the critical role of humans in advanced systems. Her keynotes are both professional and personal, making her an exceptionally inspiring speaker. Keynote speaker Mandy Hickson has flown multimillion pound jets for the United Kingdom Royal Air Force. 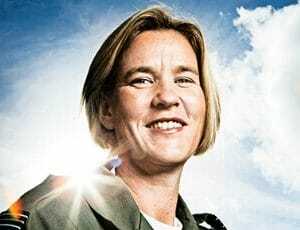 The only female pilot on her Front Line Tornado Squadron, she has operated in extremely hostile environments, including Iraq’s “No Fly” zone during the Iraq War. Along with her unit, she carried the last weaponry and was ready to drop ordnance upon orders. Mandy Hickson’s route to the skies was intense and tumultuous; at age 17, she received a Royal Air Force flying scholarship, already winning acrobatics competitions during her time as a student. Although an expert in practice, Mandy Hickson failed her mandatory computer based tests, but by sheer determination and with reference to her excellent skills in the skies, she convinced the Royal Air Force to accept her as a test case. With unyielding determination, our speaker Mandy Hickson has overcome great hurdles in her career. These experiences led her to co-found Inspiring Women for Work, an organization that helps women rebuild the confidence that they need to return to work and realize their full potential after a career break. In her keynotes, Mandy Hickson draws on her experiences with working in a team of elite fighter jet pilots. It is one of her main points that the same values apply within any environment; the importance of maintaining a calm demeanor under pressure, as well as leading from the front in order to achieve the best results from one’s team. A trained Human Factors facilitator, the adamant speaker Mandy Hickson is an expert on interactions among humans, and she understands in great detail the role of human beings in complicated systems. She applies this expertise, as well as her personal experience calculating risk and making important decisions under pressure, to businesses, demonstrating a remarkable understanding of humans and organizations alike. She was an excellent presenter: humorous and engaging, with a fascinating real-life and high altitude story to tell to students of all ages. The queue of students who stayed behind at the end to speak to Mandy was testament to the overwhelmingly positive response to her talk.